SMS channel can be widely used in GPS monitoring systems. One part of messages is dedicated to the two-way communication between server and GPS trackers, another part is dedicated to the interaction with users. That’s why it’s really important a server could extensively interact with SMS gateways. Let’s take a look on how Navixy handles it. 1. GPS devices primary configuration. It’s very convenient when GPS trackers are manufactured on demand in big volumes, bundled with SIM cards and being configured by the manufacturer to work with the particular GPS monitoring system. Unfortunately, it is not the rule for most cases. Usually users and integrators connect various devices from different manufacturers and bundle SIM cards from several mobile network operators. That’s why to connect to the server users have to configure their devices by themselves, at least define parameters for APN, server address and port. It can be done manually by connecting the device to the computer. But that’s quite inconvenient due to the fact that a user has to install drivers, srecial software, and even sometimes to purchase a special cable. Fortunately Navixy offers an alternative solution – the platform sends a set of configurational SMS, adjusting everything automatically. The number of SMS messages is minimal: only to connect a device to the server. The rest of settings are being handled with GPRS/IP. 2. Backup bearer channel. In case of emergencies (if GPRS exchange channel is unavailable due to the low GSM signal, international roaming is turned off, etc., but you need to track an object immediately) SMS channel will be utilized to send commands requesting the current location and getting a response from the device, also by SMS. 3. Device configuration. Frequently budget models of GPS trackers can be remotely managed only with SMS with no GPRS protocol available. In this case a user can utilize system widgets for establishing new settings. Server will send necessary commands to the device via SMS. Please note that in the afore mentioned cases SMS channel is used in both directions: to deliver commands from the server to devices, and to receive responses and information by the server from devices. 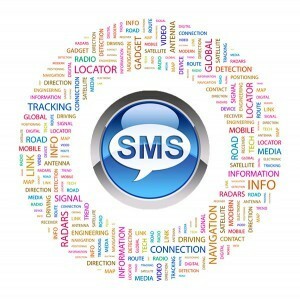 SMS messages are used to interact with the GPS monitoring system users. First of all users may receive notifications about the events they define (e.g. SOS-button activation, Geofence border crossing). Some people may say that such functions are default for many devices and there is no need in using GPS monitoring system. Though, try to define such notification for the ‘lost GSM connection with the tracking device’ event, or for the ‘exiting the complex polygon Geofence’ event for the working hours on the weekdays with the simultaneous notification of 5 people. That’s why Navixy’s SMS notification system is much more powerful, flexible and safe. Second example: when the SMS channel is used with a user – they are the SMS commands from the trusted (accredited) numbers. For example, a user of a regular cell phone (not a smartphone) can send a text “?” to the GPS monitoring system service number. In response he will receive a text message with the complete address of the current (or the last known) location, speed and other movement parameters with the link to the map. The same command may be applicable to block the engine. Of course, today the number of smartphones in the world exceeds 50% and SMS notifications fall by the wayside. Push-notifications currently replace SMS messages in mobile apps. The users of our X-GPS Monitor app for iOS and Android can experience this feature as well. The first two variants are professional. They allow to send and receive tens and hundreds of SMS messages per second, take care of the network-to-network interaction with other mobile operators, spam protection, etc. We would highly advise these particular solutions for commercial GPS monitoring purposes. Third variant is less professional. It will suit the companies that use the GPS monitoring service for its own needs, maximum for insignificant commercial services. The idea is that a GSM modem will be installed in your office to send and receive SMS messages. Therefore, you can rent your own local number for the inbound messages, define originator for the outbound messages, use 2 independent gateways for M2M and user messages. All the inbound and outbound messages of your clients can be charged according to the tariffs you set. During a free trial period, our customers have an opportunity to use the Navixy SMS center. Numerous solutions with Navixy. Your move!